Last year we represented WY at the International Blues Challenge in Memphis. Great fun and a learning experience as to the state of modern day blues in America. This year it is Gary Small and the Coyote Brothers and Chad Lore. 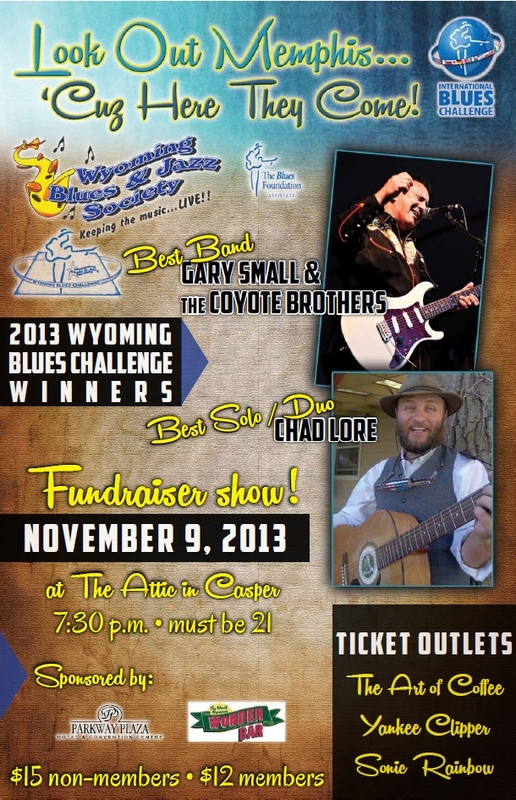 the Wyoming Blues & Jazz society is setting up a gig on Saturday Nov 9th to help raise $$ for the trip there and back. last year it cost about $1.4K per person to get out there and eat and drink and eat and the like for the week. and the WY Blues & Jazz folks help us crack that nut. i am going to play a short solo opening set to kick things off. Come on up to Casper….or just send a donation to the WYO B&J folks to help get the boys to Memphis….and back.